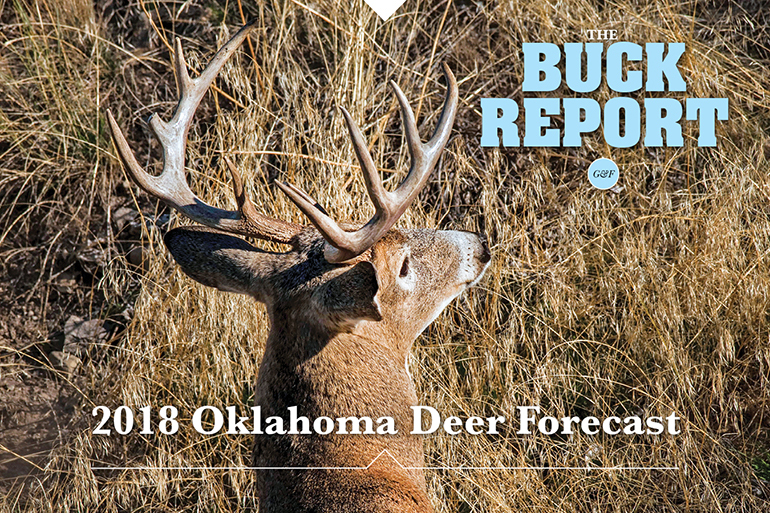 This detailed analysis of the Oklahoma deer picture will give you a realistic view of your 2018 hunting prospects. Bigger bucks, bigger numbers; looks like Oklahoma has finally bounced back. For the first time since 2012, our state’s deer harvest tally jumped back up over the 100,000 mark for the 2017 deer season. It also seems to have recovered in a big way, with more 200-plus-inch bucks on the ground than anyone can remember. To be clear, a total of 107,914 isn’t a record-breaker like the 2006 harvest of 120,000, but the return to that 100,000-plus figure along with an impressive big-buck lineup qualifies this past season as a head-turner. Will 2018 repeat or even be an improvement on 2017? That’s anyone’s guess in a state that has shown it can go plus or minus 5,000 to 10,000 a year depending primarily on the weather during the season. However, it is apparent that most areas of the state now have the deer numbers and, despite whatever weather comes, much of what 2018 produces will depend on how well hunters are able to make adjustments. There is even a temptation to think Oklahoma deer hunting is not only experiencing a resurgence but a sort of rebirth, with bigger bucks along with the return to higher harvest. Most remember the heart-breaking season of 2013, when the harvest plunged from a five-year average of more than 105,000 down to about 88,000. After four years of drought, deer numbers in western Oklahoma were noticeably thin, and elsewhere production was spotty, with a herd that just generally was not as healthy or productive as it might be otherwise. The irony of 2013 is that it was the year that marked the end of the drought for most of the state. While the drought was in progress it actually worked to the advantage of hunters who planted food plots and put out deer feeders. When the rains finally came, the land was so thirsty it sprang back with unparalleled vigor. The grasses grew tall and the only thing thicker than the brush was the acorns and the persimmons. Hungry deer no longer relied on finding dinner at a food plot or a feeder. They didn’t have to go far for a meal at all. Combined with a hot October and snowstorms in November, the harvest plummeted. The 2017 season was simply pleasant, he said. “We had really good weather throughout the season, never really too cold, not too awfully hot, so we had good participation statewide,” he said. While harvest numbers took their time recovering since 2013, things changed for hunters as well. Barber said more and more hunters are passing up smaller bucks, and it has shown up in age data from jawbone collections. Improved technology is another big factor, he said. Indeed, most of the hunters who took the biggest bucks in 2017 commented in news reports and Facebook posts they had been watching them for two, three or four years. “And we saw bigger bucks pretty much across the state; it wasn’t just one or two counties that dominated,” Barber said. When it comes to deer numbers, there is one county that annually posts the largest harvest. Osage County tallied 5,141 deer in 2017, and that is the first time the county saw 5,000-plus harvested since 5,800 were taken during the record-breaking season of 2006. Big bucks came from all over the state, although the biggest headline makers were from the central part of the state. Larry Wheeler’s two 200-inch plus bucks came out of Pontotoc County, and Steven Everett’s new No. 2 all-time non-typical came out of Logan County. But Kyle Evans popped a 17-point 200-incher up in Noble County, and the buck that could have been this state’s new No. 1 was found dead tangled in barbed wire in LeFlore County to the southeast. Of the state’s Top 10 counties, it’s No. 8 that is the standout in terms of density of harvest. A side-by-side comparison of total square miles in Cherokee County compared to Osage County shows a harvest of 2.3 to 2.5 deer per square mile in recent years in Osage to 3.3 to 3.5 in Cherokee. In public hunting area terms, that should put these two counties on anyone’s list. Effort rewards the hunter no matter the place, time, conditions or density of deer — even when things look dire. Scott Parry saw scorched earth as the Northwest Region Biologist for the Wildlife Department watched wildfire rip through parts of his region in April, but he still has hope for the 2018 deer season. Fire can improve deer habitat in the long run, but a year of drought followed by burning 350,000 acres just a month before fawns start to drop is not in anyone’s strategic management plan. “The Dewey County fire, at 5 p.m. on that Thursday, the humidity was 3 percent and wind 45 miles per hour; at that point in time it is just a blanket of fire; everything burns; even the posts holding up guard rails along the road by the creek are burning, several thousand acres,” he said. That fire burned about 250,000 acres, and another near Woodward burned roughly 100,000. Other fires hit the West, but none reached that scale of destruction. Parry said when he hunts this coming season he’s just going to have to change things up and go where the habitat is holding the deer. “These deer will find those nooks and crannies, a half-acre here, a half-acre there; you just have to adjust along with them,” he said. Oklahoma deer hunters did something in the 2017-18 season they never had done before. They took deer on private lands managed under the new Oklahoma Lands Access Program (OLAP), which launched Sept. 1, 2017. Numbers taken on the OLAP properties the first year are not available because the program was so new, and lands were not secured in time to enter them into the E-Check system, but that will be remedied for 2018, said Jeff Tibbits, OLAP coordinator. A $2.26 million grant from the U.S. Department of Agriculture, as part of the 2014 Farm Bill, was used to launch OLAP under the Voluntary Public Access-Habitat Incentive Program. Oklahoma’s program is modeled largely after the Kansas Walk-In Hunting Access program (WIHA) and opened with 40,000 acres available for walk-in hunting across the state. For 2018-19, managers plan to add more walk-in areas, particularly in southeast Oklahoma, with improved access to the Honobia Creek Wildlife Management Area and Three Rivers Wildlife Management Area, Tibbits said. The program is a broad-use opportunity and focuses more on small game opportunities and fishing.